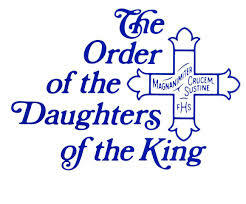 The Order of the Daughters of the King is a group of women striving to fulfill the promises of our Baptismal Covenant through the adoption of a Rule of Life. Every daughter pledges herself to a life-long program of prayer, service and personal evangelism, dedicated to the extension of Christ’s Kingdom and to the strengthening of the spiritual life of her parish. Prospective members go through about an 8 week discernment study before being admitted to the order. The DOK sponsors a Lenten Retreat at Camp Crucis and a Spring Assembly after Easter each year. All women are invited to attend. See the Events page on this site for details. The Order of the Daughters of the Holy Cross is composed of women who have committed our lives to the work and service of our Lord Jesus Christ. We pray daily for our church, its clergy, the Order and others in need. With the guidance of the Holy Spirit, we reach out to those who do not know Jesus and share His message of salvation through word and deed. We equip ourselves with the powerful sword of truth as contained in the Holy Bible. We wear our cross as a symbol of Jesus sacrifice and our need for Him to be in our daily lives and we become encouraged and strengthened in community with our sisters. It is open to all Anglican women. The Order provides a community in which you can fulfill a lifetime vow to our Lord and Savior, Jesus Christ. The Order’s four-fold vow consists of Prayer, Service, Study and Evangelism. We expect and assist each member to earnestly develop and practice each of these areas. Each chapter is autonomous, those chapters in proximity may form alliances. Chapters: Good Shepherd, Wichita Falls, Christ the Redeemer, Fort Worth, St. John’s Fort Worth, All Saints, Monroe, LA, St. Stephen’s Hurst, Christ Church, Midland with daughters at many other parishes throughout the diocese.